ON THE PLANET CAN SWEEP 280 TOXINS OUT OF YOUR BODY TO HELP RESTORE GOOD HEALTH! • DROP EXCESS FAT AND LOSE WEIGHT! • EASE UNCOMFORTABLE DIGESTIVE ISSUES! And spinach is just the beginning. 10 servings of today’s spinach equal one serving from 50 years ago. One of the main reasons for this decline is because growers create “hybrid” forms of your fruits and vegetables. Not for their ability to store nutrients – but for their color, weight, and shelf life. Why? So they’ll look nice and pretty when they sit under the fluorescent lights of your supermarket. they contain little more than indigestible cellulose, sugar, and water. To help protect you from this nutritional travesty, I created a formula of powerful “green foods” that gives you the nutrient power of over 9 pounds of assorted fruits and vegetables – all from drinking a naturally fortified glass of juice or water. Just mix in 2 teaspoons and you’re done! My name is Dr. Al Sears, M.D., and I’ve dedicated my career to helping my patients, my readers, my friends, family – and you – get the nutrition needed for optimal health and wellness. Senate. It was a dire warning that the mineral content of the soil was eroding. Vegetables were losing their power, and people were at risk. Unfortunately, Congress did nothing. have wiped out much of the nutrient content in the soil our produce is grown in. Minerals like iron and magnesium have dropped by more than 80%. That’s from commercial-farming technology and powerful fertilizers that practically sterilize the soil – leaving it with little to no mineral content. I wasn’t the only one to realize your fruits and vegetables don’t pack the nutritional punch they used to. A report from the University of Texas in Austin also tracked the decline of nutrients in produce. Advancement of Science in St. Louis. They found significant drops in a wide range of produce across the board, including a 20% decline in vitamin C and a 38% plunge in vitamin B2. indigestible support tissue like the white fibrous netting around an orange section), and less of everything else. Growers call this the “dilution effect.” For them, more water and more pith help their produce ship well, look good, and weigh a lot. But it virtually wipes out their vitamin and mineral content. The plunge in nutrients in your produce over the past 30 to 50 years is bad enough. But it is rapidly getting much worse. Genetic hybrids are pushing nutrient values even lower. A popular broccoli hybrid called “Marathon” is an alarming example. By the USDA’s own admission, levels of calcium and magnesium in the Marathon hybrid are 35% lower than other hybrids. The hybrids themselves are 50% lower in calcium and magnesium than “normal” broccoli. And the “normal” broccoli has less than half the calcium and magnesium than broccoli did in 1975! Now you can get them back! I’ve created a unique “superfood” that gives you back everything you’re missing from your altered food supply. My “green formula” has all 71 minerals your body needs every day – and they’re easy to absorb! Barley grass is one of the most wellbalanced sources of nutrition you can get. It has an optimal blend of amino acids, proteins, enzymes, vitamins and minerals. Its healing powers are so historic you find it mentioned in the Bible. “Green foods” like barley grass, spirulina and chlorophyll are superfoods packed with the original vitamins that you need — but are no longer getting from your produce. Spirulina is the oldest food on earth, arriving on this planet over 3.5 billion years ago. It’s actually a kind of blue-green algae. After 30 years of clinical study, researchers agree it’s the world’s richest source of vitamins, minerals, iron, protein and a host of other energizing and detoxifying nutrients. It’s so powerful that scientists at NASA consider it the perfect food for astronauts when they travel into space. In fact, one pound of spirulina has the nutritional power of 1,000 pounds of assorted vegetables! Then there’s barley grass. These greens are so well balanced, it has the EXACT blend of amino acids, proteins, enzymes, vitamins and minerals that you need for optimum health. Its healing powers are so historic you find it mentioned in the Bible. Super Greens is packed with these healthy phytochemicals. But unlike most green foods on the market, Super Greens has the perfect blend of the three most powerful superfoods on the planet: Barley grass, spirulina and chlorophyll. These three superstars are the core of my formula. I’ve been using Super Greens with my patients, too. Its wide range of healing power consistently amazes me. Living in the 21st century affords you many luxuries: high-speed computers… cell phones… air conditioning and plasma TVs. But the chemicals and industrial solvents that make them possible are poisonous. And they’re flowing through your blood as you read this report. In 2005, the nonprofit Environmental Working Group published the results of a sobering study. After analyzing the blood of newborn babies from around the country, they discovered 287 chemicals and other toxins.4One of the pesticides that turned up the most was a by-product of DDT – a pesticide banned in 1972. At this point in history, we’re being poisoned before we take our first breath! The results were not surprising: 84 distinct chemicals, solvents and toxins that are known to be harmful to your health were found in his system. These chemical residues – termed the “chemical body burden” – are present in every human being on this planet, regardless of where you live or what you do. The message is clear: Studies on animals show that the average person is carrying enough toxins to cause serious DNA damage. That’s where my Super Greens formula really shines. The word chelate comes from the Greek word meaning “claw.” During the process of chelation, the amino acids in barley grass grab – like a claw – onto toxins like the chemicals and heavy metals flowing through your bloodstream. No other nutrient or supplement can manage such a remarkable feat. And when these powerful green foods are used in combination – like you find in Super Greens – the results can be life-changing. Spirulina also has this chelating – or “claw-like” – ability. The nutrients in Super Greens work on a cellular level, revitalizing your entire body and giving you a whole new outlook on life. transformations.” Some of the results are near miraculous. This is critical, especially if you’ve been eating bread all your life. The difference in your energy levels – and your moods – once this is cleared up is worth taking Super Greens all on its own. Taking Super Greens Is Like Having an Ironclad Insurance Policy That Protects You From the Greatest Health Threats of Our Time… and It’s Totally RISK-FREE! You can try it right now with absolutely NO RISK – and for just pennies a day. I take Super Greens EVERY morning. After doing the research and seeing the results for myself (and in my patients), I don’t miss a day. I’ve arranged a special price for you: As little as 87 cents a day. That’s less than a daily run to Starbucks… and you’re getting a whole lot more energy than a cup of coffee can give you. Super Greens is a proactive way to ensure you stay vital, active and healthy – well into your 80s, 90s, and beyond. nothing to return and no time limit. without any worry or inconvenience. health effects of the industry’s bigger, fatter, faster, more profitable practices. • Is all salmon safe to eat? • Is soy straight from nature? • Does diet soda make you fat? • What are four easy ways to go organic? • Which foods can you eat guilt-free? • What’s the “giant experiment” with your food? And one more thing, when you have your own Super Greens miracle, send me an e-mail or a letter and let me know! I’d love to hear what it’s doing for you. P.S. My Customer Care Team has lined up a great deal for you on our convenient VIP Auto-Delivery Program … as little as 87 cents a day. Please see the Risk-Free Savings Certificate below for all the details. 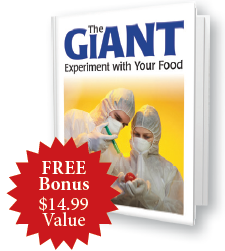 Plus, don’t forget, you’ll also get a FREE copy of my special e-report The Giant Experiment With Your Food – a $14.99 value – at no extra cost, if you act now. Just choose the option on the Risk-Free Savings Certificate that’s best for you, and get Super Greens delivered right away. As the first U.S. doctor licensed to administer a groundbreaking DNA therapy that activates the gene that regulates telomerase, Dr. Sears made history by bringing telomere biology to the general public. In 2006, Dr. Sears shocked the fitness world by revealing the dangers of aerobics, “cardio” and long-distance running in his book, PACE: The 12-Minute Fitness Revolution. YES! Dr. Sears! I want to restore balance to my body and stay vital, active and healthy! Please RUSH me my RISK-FREE selected order of PRIMAL FORCE Super Greens and send me the link to download my FREE bonus e-report. 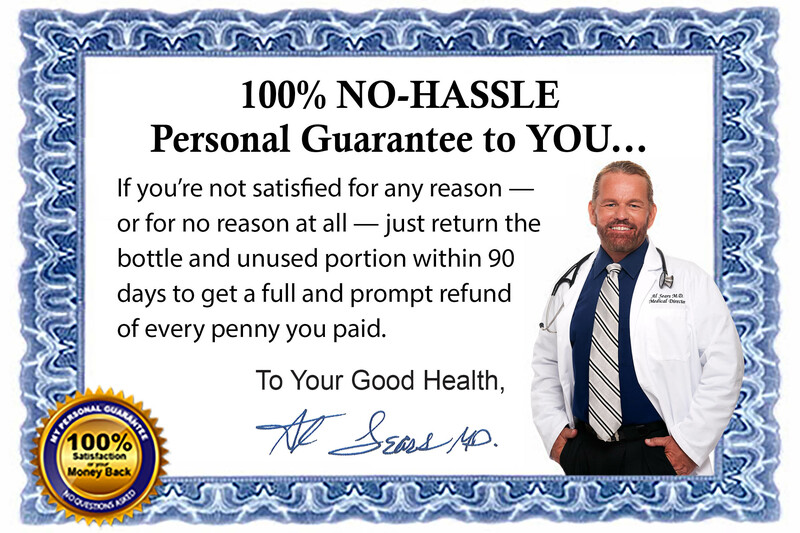 I understand that my order is completely protected by your 100% money-back guarantee. You’ll SAVE 36% when you order a 6-month supply (6 Jars) for only $167.76 with FREE shipping and handling and receive a free special eReport The Giant Experiment With Your Food. That’s a total savings of $95.64! GREAT DEAL: You’ll SAVE 28% when you order a 3-month supply (3 Jars) for only $94.35 with FREE shipping and handling and receive a free special eReport The Giant Experiment With Your Food. That’s a total savings of $37.35! 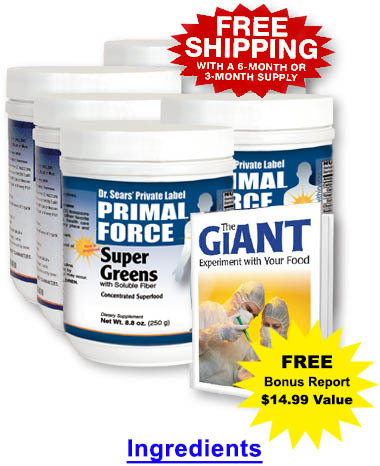 TRIAL OFFER: Order a 1-month supply (1 Jar) of Super Greens for $34.95 plus $8.95 shipping and handling and receive a free special eReport The Giant Experiment With Your Food. Maximum Savings and FREE Shipping Forever! Save even more by signing up for our VIP Auto-Delivery Program. Your credit card will be automatically charged to ensure on-time delivery before you run out of your supply of Super Greens. Plus, you’ll get FREE S&H on every shipment. You can cancel at any time with no hassles or explanations by contacting Customer Support toll-free at: 1-866-895-8555 or by email at support@alsearsmd.com. SAVE 40%: 6 Jars every 180 days for only $157.28 + Free S&H. Total Savings of $106.12! SAVE 36%: 3 Jars every 90 days for only $83.88 + Free S&H. Total savings of $47.82! SAVE 20%: 1 Jar every 30 days for $34.95 + Free S&H. Total Savings of $8.95! 2 “Vegetables without Vitamins.” Life Extension Magazine. March 2001. 3 “Better than Vitamins.” Newsweek. April 25, 1994. 4 Environmental Working Group. “Body Burden – The Pollution in Newborns.” July 14, 2005. www.ewg.org. 6 Janet Zand, LAc OMD; Allan Spreen, MD CNC; James LaValle, RPh ND. Smart Medicine For Healthier Living. p.164. 7 Paul Pitchford. Healing With Whole Foods. p.192. 8 Glenn Geelhoed, MD; Jean Barilla, MS. Natural Health Secrets. p.22.